Stones with no alignment e.g. Waymarkers, Indicators etc. A stone about 1.6m x 1.0m x o.3m with a similar sized stone leaning against it and orientated approximately NW/ SE. It seemed possible that it could be a broken stone (but see later). This standing stone formerly stood about 3.1 metres from the most westerly of the three cairns described under NM94SW 10. When it fell, it was re-erected on its present site (Smith 1879). As it now stands, it measures 0.45 by 0.15 metres at its base and stands 2.1 metres in height. Visited by OS (RD) 9 November 1971. There were clear views to the north east. this was measured for the purposes of the chance alignments assessment. No alignments were found. There is one rough conglomerate block. No others were found. 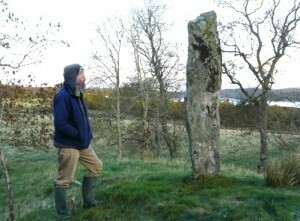 As reported by Ruggles:- A squat standing stone 1.2m tall which appears originally to have been taller. It is roughly triangular in cross section. A large square block of conglomerate about 3.4m x 1.2m x 1.2m with a smaller dome shaped stone about 1.3m high and about 50m to the SE which might be genuine. The line of the stones to the NW is clear of trees but otherwise nearby and hillside trees obscure any possible alignment. (For example in the opposite direction.) The line of the stones to the NW is close to 306°. Alignment for the sun (Thom epoch 3, MSB pp.113/114) could be indicated. There is a stone circle + a kerb-cairn in the area. See Thom (SRSS 1990, BAR 560(i)) where there is also given a possible solar alignment to the SE. To the ENE the horizon lacks features. To the WSW there is a steep nearby hillside with a wood on the horizon. This direction is indicated by the stump. Measurements showed that the direction was consistent with the ‘Bronze Age Equinox’ i.e. half way between the solstices by time, which gives about +0°.5 declination.The hidden hillside was visited. No obvious features were found but inevitably the angle of viewing was not the same as from the stone. The bumps and hollows would appear different.